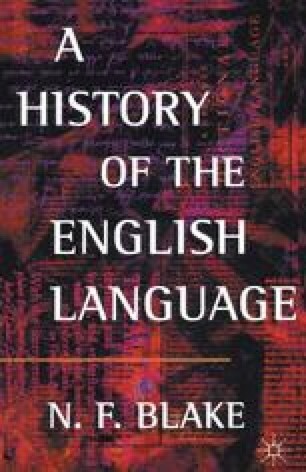 This chapter deals with the period from the demise of the influence of standard Old English, which occurred in the middle of the thirteenth century, until a new standard began to emerge under the influence of the Lancastrian monarchy at the beginning of the fifteenth. After 1066 three languages were available in England — French, Latin and English — and it is with the position of French and relations with France that we must first begin. Although the kings of England lost their Norman possessions in 1204, they did not cease to have any involvement in French affairs. In the last chapter we saw in the passage from The Peterborough Chronicle that in 1152 the French queen divorced the king and married Henry of Anjou, who became King of England in 1154. This French queen was Eleanor of Aquitaine who brought with her as dowry Aquitaine, made up of the two provinces Guyenne and Gascony. But the English presence in Aquitaine was quite different from that in Normandy. The conquerors of England had held lands in Normandy and thus had possessions on both sides of the Channel. Although the kings of England became dukes of Aquitaine, the number of English people who held lands there was small. If anything the tendency was the opposite: Gascons came to England and acquired lands here. Often this caused resentment and anti-French feeling among the English nobles. In 1328 Charles IV of France died without immediate heirs, and as Edward III of England was the son of Isabella of France, Charles’s sister, he claimed the throne of France through her, though this claim was dismissed in France since the Salic law did not allow inheritance through the female line. Edward was not strong enough in 1328 to take steps to pursue his claim. The French for their part elected Philip of Valois king. When in 1338 Philip started to support the Scottish king against the English, Edward pressed his claim more strongly and decided to follow up his claim with force. This was the beginning of the Hundred Years War, which lasted until the middle of the fifteenth century when England lost all its possessions in France except Calais. The war fluctuated with now one and now the other side gaining the advantage. To start with England enjoyed some spectacular success, with victories at Crécy in 1346 and at Poitiers in 1356 and the capture of Calais in 1347. At the treaty of Bretigny in 1360 many of the gains in northern France were lost, though Aquitaine remained in English hands. English fortunes remained low until the fifteenth century when Henry V’s victory in 1415 at Agincourt swung the war England’s way. Since the fifteenth century saw the beginnings of a new standard language in England, the progress of the final stages of the Hundred Years War belongs to our next chapter. In addition to the dynastic quarrels that existed between France and England, the two countries were often involved in trade disputes involving wool. English wool was a major export commodity and was greatly prized on the Continent, particularly in the Low Countries where it was turned into finished fabrics. The export of wool provided the kings of England with an important part of their revenue and they wanted to control the trade. It was important for them to retain access to the markets in the Low Countries and this need often clashed with French interests. In addition the wine trade with Gascony was considerable at this time.